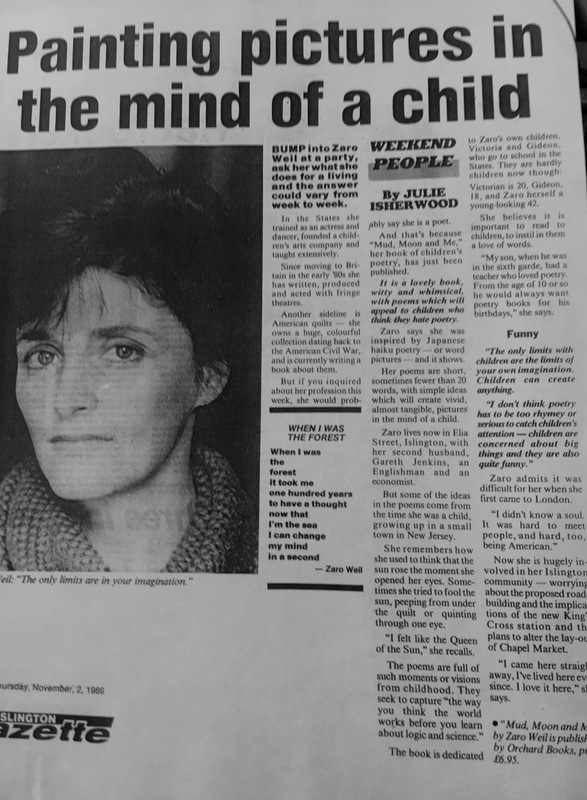 For those of you who are curious about who exactly I am and how I came to write these pieces and create ZaZaKids Books, the following extracts from some early teaching journals, info on my zany theatre and dance career, my writing obsession, and a few details about my unexpected publishing life, etc might be fun. I began my work at the New City School, an alternative school set up in St Louis, Missouri along the lines of Summerhill. I started teaching that year by repeating as many exercises that I could remember from my university drama classes and various training courses. 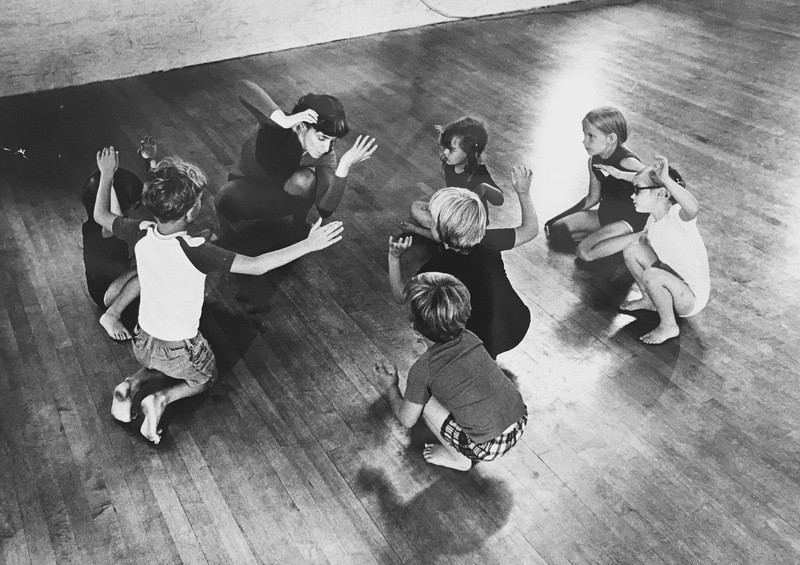 I also began to develop and explore movement activities with my classes to encourage the growth of the total child. The following summer I was hired by the Special School District to teach “Creatives” in a six-week summer school program. I continued my teaching at Central Institute for the Deaf over the next few years and Mary Institute. 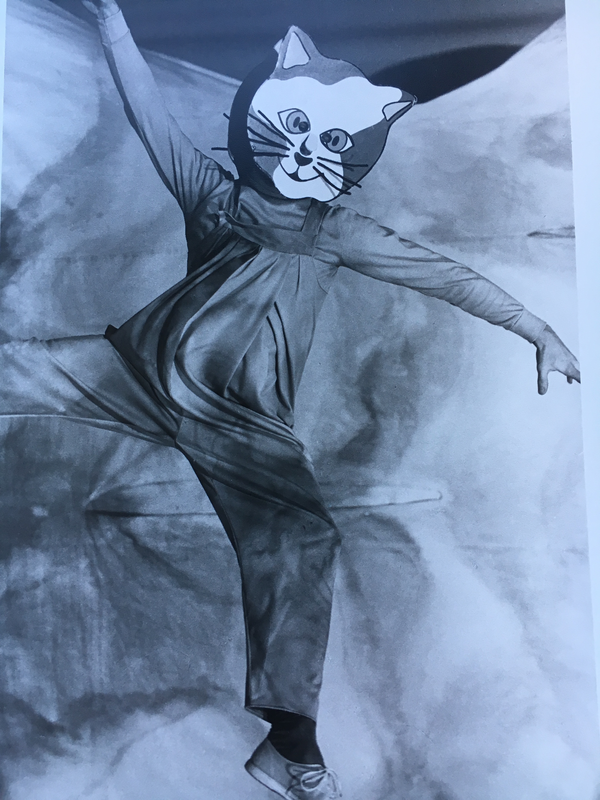 I also continued my dance work in Modern and Improvisational Dance at Washington University. 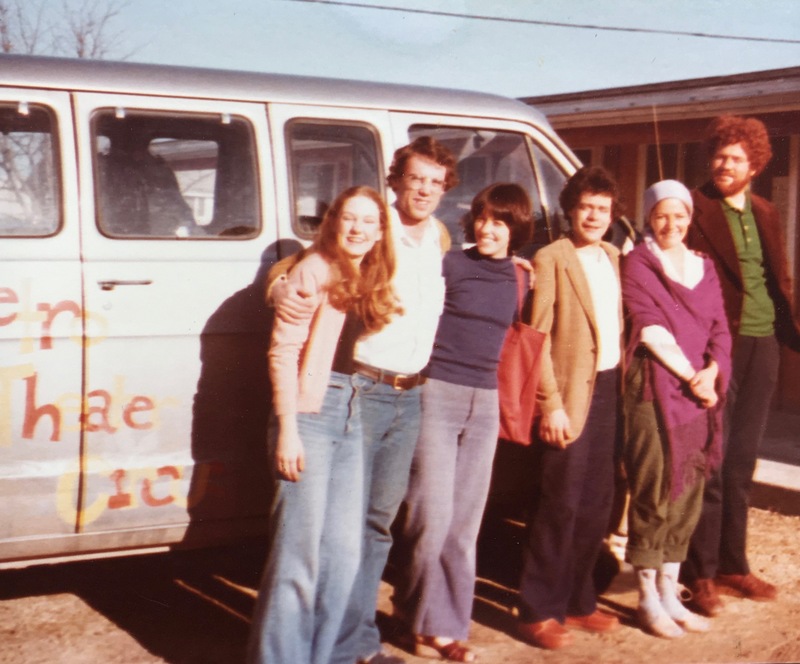 I was lucky enough to study with wonderful dancers; Merce Cunningham, Dan Wagoner, Phyllis Lamhut and Meredith Monk. These early teaching experiences taught me that learning must involve the whole child. It should involve his brain, his body, his emotions and his imagination. As a result, I came to believe wholeheartedly in the child as an individual who is separate and distinct from anyone else. I realised my responsibility as a teacher, writer and performer was to encourage the growth of the total child. I was then invited to teach in the MAT PROGRAM (Masters of Arts of Teaching) at Webster University and by Annelise Mertz to teach children at Washington University. At the end of an intense period of teaching all kinds of children and adults in a variety of circumstances, my mind was made up. I would follow my dream. I would hit the road and start a travelling theatre dance company for kids with the best actors, dancers and musicians around. We would only use live music. It was clear that classroom visits after the shows and teachers workshops would play a vital role in our visits. These six or seven artists would both perform and teach classes afterwards. 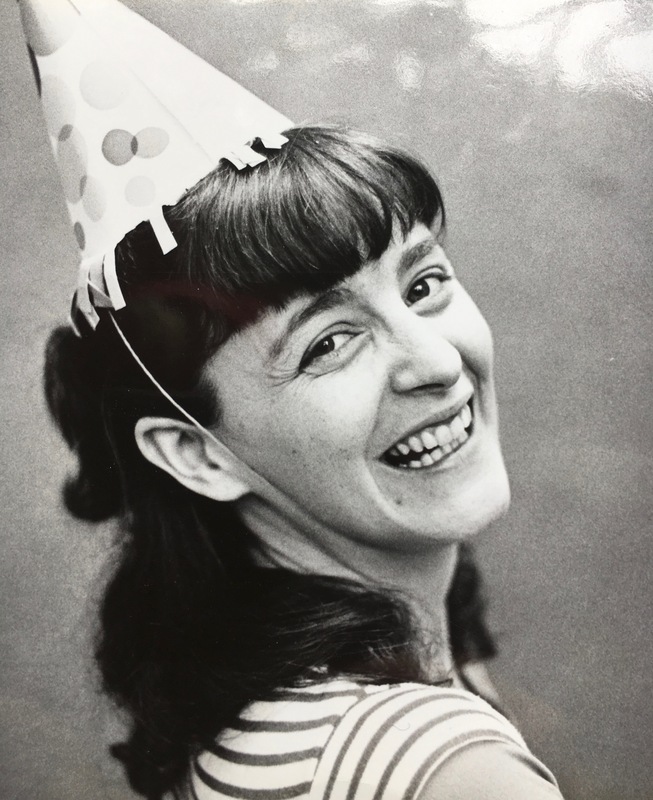 I set up Metro Theatre Circus in 1972 with Lynn Rubright. New City School gave us a big classroom for rehearsal space in exchange for the company teaching creative arts there during the week. We were set. Looking back, I am sure all this optimistic ‘get up and go’ and was linked to the zeitgeist of the late 60’s counter culture where, we were sure, if we were passionate enough, we could do anything no matter what. And it worked. The ‘Circus’ proved to be a formative and thrilling adventure in our lives. Metro’s mission was to bring live innovative theatre, dance, and music experiences to kids of all ages and social and cultural backgrounds across America. 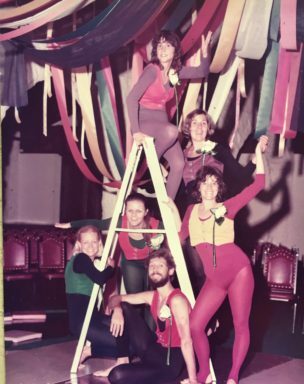 The above photo with all the ribbons was taken just after our first performance in Autumn 1973. We called our show, “THE SECOND GREATEST SHOW ON EARTH.” Included are Lynn (purple), Me (Yellow), Becky (Green), Rita (Pink), John ( Red), and Jamie (Orange). Like Firecrackers, this first show was a hum-dinger and we were hired right away by school districts all over the state and mid-west. 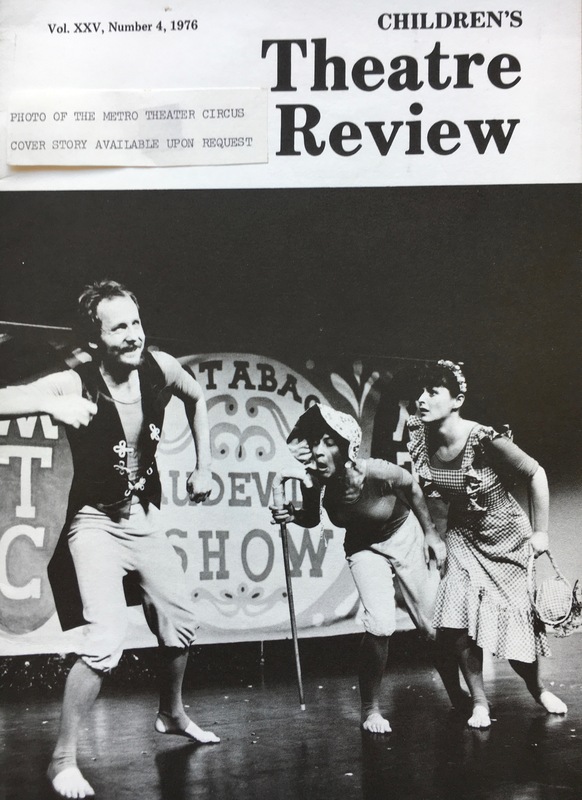 Below photo, the cover of the Children’s Theatre Review, 1976, shows the Circus performing a scene from “The Rootabaga Vaudeville Show;” a song and tap-dancing vaudeville show of short plays I wrote and lots of poetry. In this sequence I am the one with the basket. 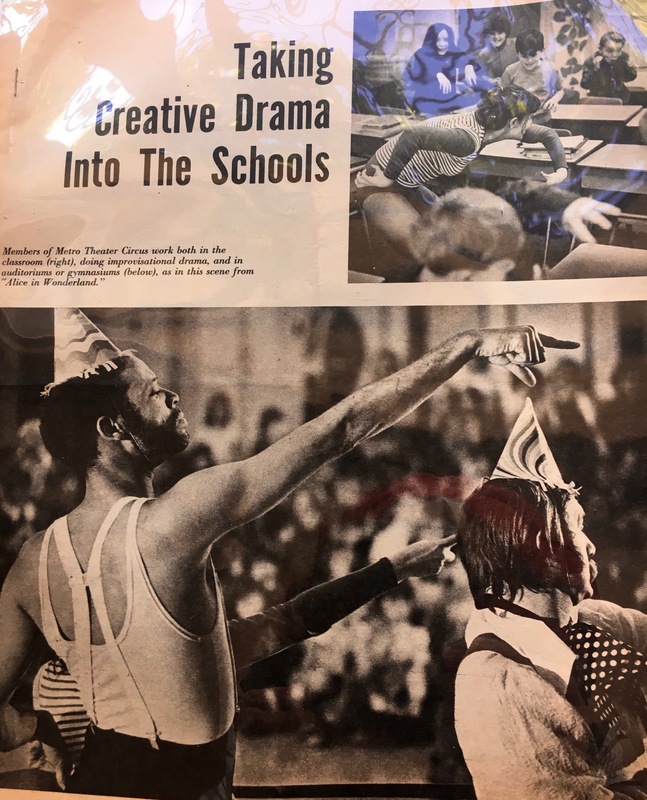 The above two photos are from a performance of SOMERSAULT which I wrote in 1978 (and which included a musical version of the rhyming play, The Three Little Pigs….it’s full text now included in Firecrackers). 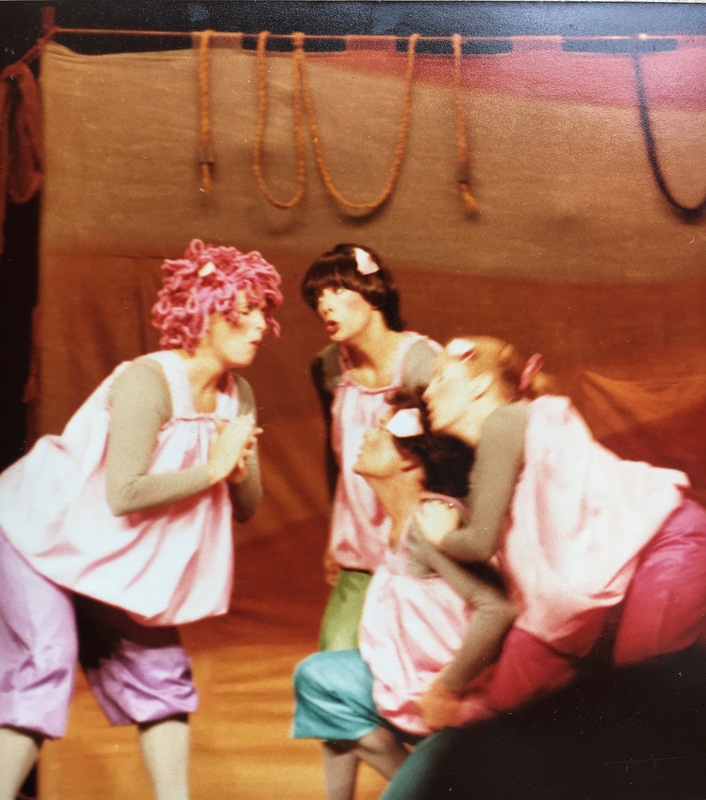 I played Mama Pig in the pink wig and talented friends Carol, Branislav and Suzanne (all in pink ears) were the three fabulous dancing baby pigs. The ingenious banjo, guitar and piano score was composed by Stephen Radek. Branislav Tomich created the brilliant set and costume design and June Ekman was co-director. 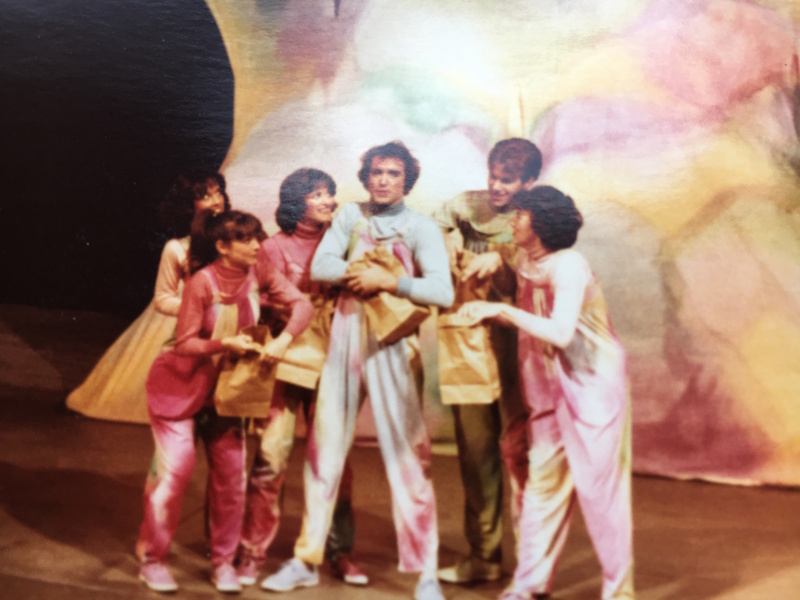 In fact, a number of poems, haikus and little plays that appear in ‘Firecrackers‘ were written by me and merrily performed by the company (myself included) in various shows during those first ten years when I was both performing and directing the Circus. We performed and taught nearly every day during the academic year in different schools and arts venues across America. It was an arduous and crazy schedule but totally wonderful. I am sure, looking back, that I personally must have played every animal there ever was as well as a myriad of creatures that never were. 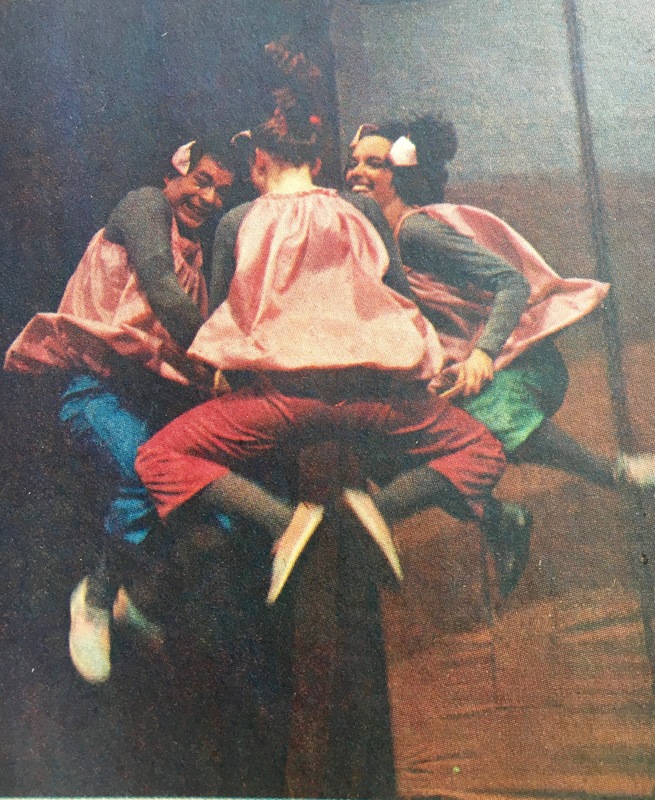 The photo below appeared in a newspaper from Kansas City in 1975 when Metro was on tour with our song and dance version of Alice in Wonderland. The curious body in the top photo is me working with 5th graders. Then in 1981 I moved to London and Metro was taken over by fellow company members, Carol Evans North and Nick Kryah. Sidebar: I remain crazily proud of Metro because this wonderful company continues to flourish. It has, over the years, touched the lives of millions of children around the world. Now implanted in London in the early eighties, I worked in fringe theatre and dance, both performing and producing. In 1988, I was working with The Liverpool Playhouse when I met the late literary agent, Rod Hall. I shyly handed him a little manilla envelope of poem/plays that I had written for a Metro show; Mudweavings. 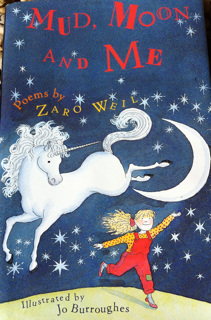 These poems were based on the idea of personal myth; those little stories we each make up as a child which help us make sense of the world. I collected these myths from family and friends. For example, one of my personal myths was thinking that the sun rose the exact second I opened my eyes in the morning. Everyone I interviewed had a different myth. It seemed to me that the re-telling of these myths, needed to take a poetic form. 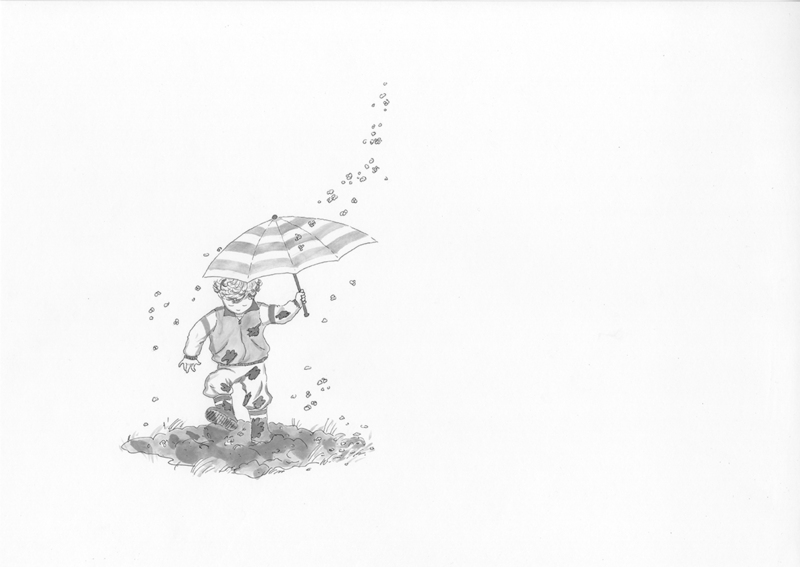 Mudweavings emerged as a musical poem/play filled with bubbling mud puddles, dancing paper bags, friendly moons, racing trees, sparkles on a morning sidewalk and freckles on a friends nose. Below is a photograph from Mudweavings, 1979-80; ‘Fill up a Paper Bag’. This poem now appears in Firecrackers. 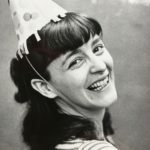 Judith has been a brilliant friend ever since that time and indeed it is her hand which has so firmly nurtured and guided Firecrackers, Spot Guevara Hero Dog, and Cherry Moon. Below is an article published by my local paper at the time, The Islington Gazette, about ‘Mud, Moon and Me’. Of course, I haven’t mentioned that during the years the Circus toured around America, I was collecting old quilts on the side. I first saw these treasures in small town thrift shops and was smitten by their beauty. I loved touching them and was in awe of the wonderful old fabrics. I started buying them and studying the historical literature about quilts. It felt like I was holding pieces of precious history in my hands. I especially loved them since I seem to have been born with two left hands and am positively the least craftsy person I have ever met. Antique quilts, at that time, hadn’t been ‘discovered’ as folk art and so it was easy to buy them for only a few dollars each. After some years, without meaning to, somehow I assembled a collection of over one hundred quilts. Naturally when I moved to London my quilts came with me. After doing a number of exhibits and writing a book for HarperCollins ( The American Quilt Story under the pen name of Susan Jenkins ) about the history of American women and quilting traditions, I decided to start a publishing company in 1992. It was a leap to be sure. But then I was used to leaps. The company, based in an old warehouse a few blocks from where I lived in Islington, was originally called Museum Quilts Publications. At first we published only books about quilting. Then we moved onto other crafts, cooking, biography, health, history, gift and more. And after a few years we had a team of 35 people in both London and New York and were producing a lot of books on all kinds of subjects. And our name had changed to MQP Books, LTD. I was CEO and publisher of that company for 16 years. And that is how I came to learn about publishing. After leaving London in 2007, and following a dream once more, I moved to rural France to an old stone farm. 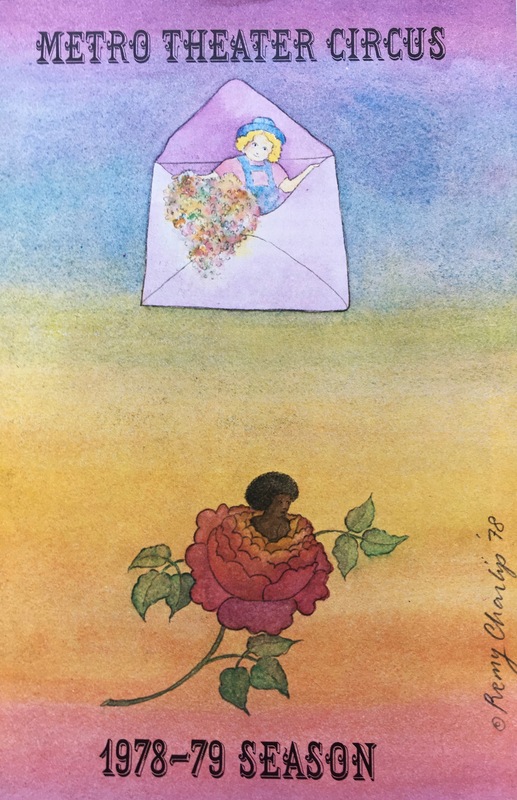 Waking up each morning to the thrill of a bright orange sun rolling over the horizon, I found myself coming back to my writing roots: writing for kids. I was inspired by what I saw and heard every day in the countryside. The authenticity, wildness and beauty of country life cast its spell. I couldn’t put my pen/computer down. And still can’t. It seemed a good idea after writing all these poems and stories, and books to create ZaZaKids Books to publish my own work. But ZaZaKids needed to be a professional organisation, and having previously been a publisher for 16 years, I knew what that meant. And I knew how hard it could be. And then, the stars smiled. Another leap. 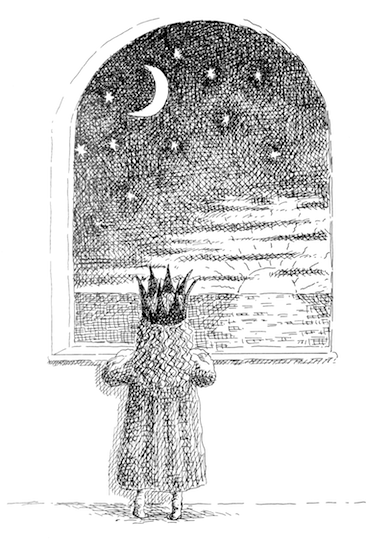 I found some brilliant children’s book professionals to work with; Judith Elliot ( my dear old friend), Roy Johnson, Louise Millar, Jo Riddell ( the wonderful illustrator…then called Jo Burroughs… who had done the gorgeous drawings for Mud, Moon and Me all those years ago), and Martin West. Once again, there was a team and once again we were set. 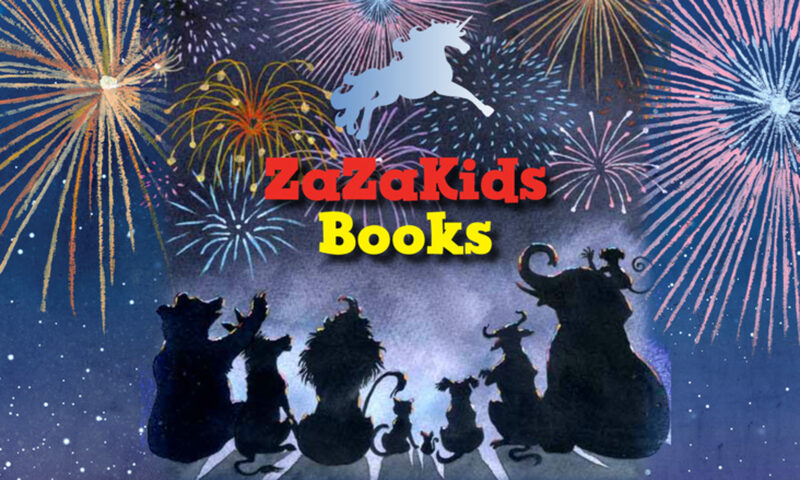 And that is the improbable, unexpected and completely true-blue story of ZaZaKids Books. Stay tuned.